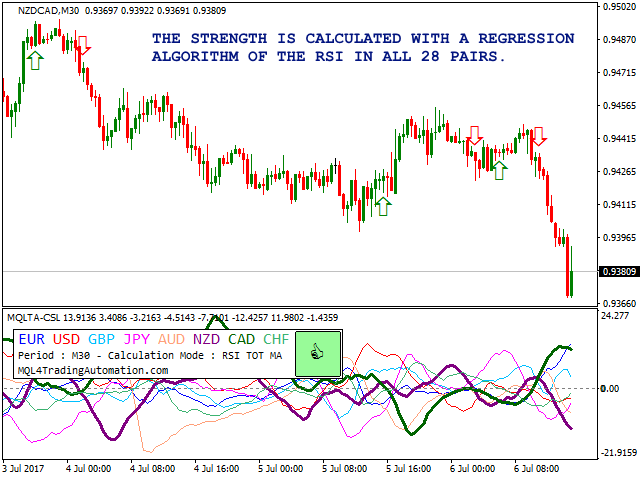 The Currency Strength Lines (CSL) indicator is a very useful tool for both beginners and experienced traders. 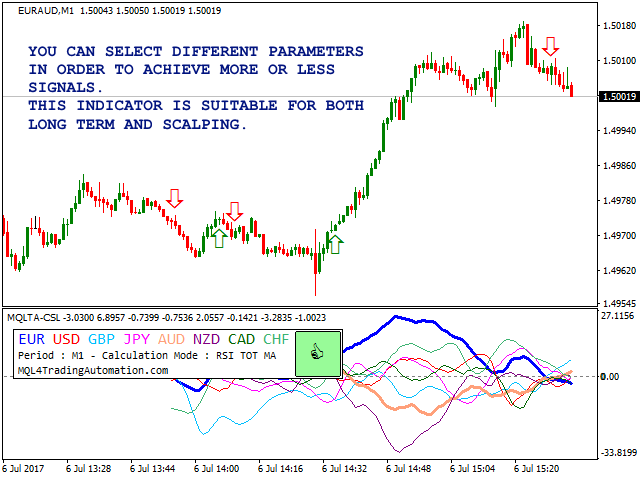 It is able to calculate the strength of single currencies and show them on a chart, so that you can see the trend and spot trading opportunities. The CSL Indicator will run calculations on all the 28 pairs, resulting in the overall strength across the market of individual currencies at any given moment. You can use this data to spot currencies that are strong, getting stronger, weak, getting weaker. If the option is enabled, the indicator will draw arrows for possible BUY or SELL signals on the current symbol. You can also select to be notified. CSL Indicator can be used for long term or scalping. It is better to confirm entry signals with another indicator or price action. Select a period to test that is quite recent to make sure that the historical data for all 28 pairs are available. To work around this process, I created a DEMO for you to to see the indicator in action with only four currencies. Check https://www.mql5.com/en/market/product/23029. You can also rent the indicator for a month for a very low price. Indicator's Name - name of the indicator. This must be different if you intend to add more than one instance. Calculation Mode - calculation method. Choose the more suitable one for your trading style. RSI Period - period of the RSI in case you select a method using the RSI (recommended between 10 and 50). RSI Smoothing - period of the moving average to smooth the lines when RSI MA is selected (recommended between 2 and 10). Show Arrow Signal - display arrows. 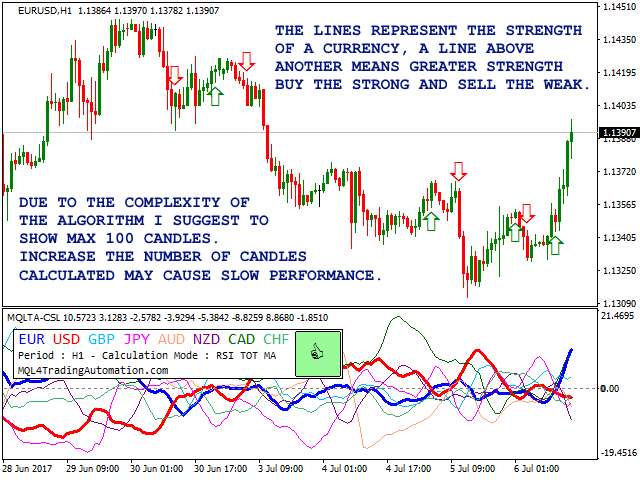 Draw when a currency is above the other - display an arrow every time the lines are crossed. Draw if lines are opposite to the zero - less but more reliable signals. Buy Signal Color - buy arrow color. Sell Signal Color - sell arrow color. Neutral signal color - stop signal color. Enable Notification - enable/disable notifications. 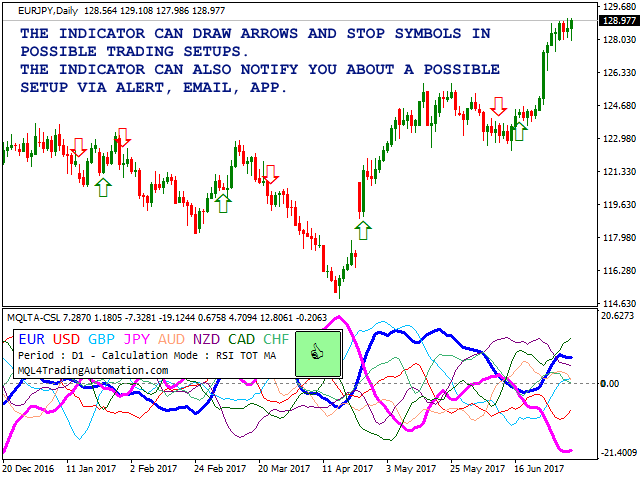 Send Alert Notification - send alert notifications (popup screen in MetaTrader). Alert Sound - file name of the sound to play during the alert. Send Notification to Mobile - send notifications to the mobile app. Send Notification via Email - send notifications via emails. Wait time between notifications - minutes of wait before sending another notification. Pairs Prefix - prefix of the pair. Pairs Suffix - suffix of the pair. This is one of the best indicators i use. This indicator was developed well and does the job. Doubled my account in a short period. Kudoz! !